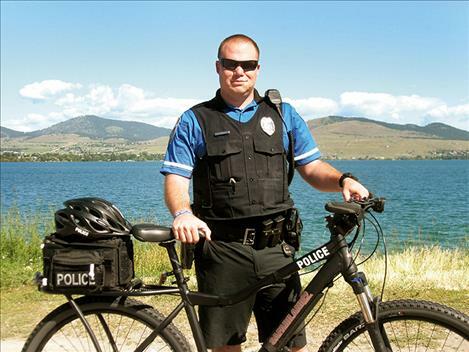 POLSON – It’s been a while, but Polson Police Department has another bike patrolman. Officer Keith Deetz completed four days of defensive mountain bike training in Bozeman with the Law Enforcement Bicycle Association in late May. His first day on the streets in Polson was May 26, he said. Although he has only been able to ride his bike on the job one or two days a week due to a shorthanded staff, Deetz will likely be able to do more of his work that way once two new officers start with the department this week. Deetz is the department’s first designated bike patrolman since Jay Doyle started riding in the early 1990s, Capt. Alan Booth said. After Doyle left, the department only had bike patrol on occasion, Booth said, noting that former officer Devon McCrea rode during special events. The Polson Police Department was able to purchase two new Safariland bikes last fall thanks to a $3,000 grant from the Montana Board of Crime Control, Booth said. The bikes are made especially for law enforcement and include lights, a siren and luggage bag. The department chipped in $600 toward the purchase and also bought some all-terrain tires. The community has been extremely receptive to the bike patrol, Deetz said. “There’s definitely a need for it. I can go down alleys and run through grass if I need to,” he said. He can also respond to areas on the city’s bike/walking path that are not easily accessible by vehicle. His tours can take him up Skyline Drive and out to Pete’s Lakeview Bar and Grill, he said. “The days that I’m on the bike I smile more often talking to people than when I’m on my normal shift,” he told the Polson City Commission on June 7. Deetz, 25, has been with Polson Police for one year. The Florida native said his first day on the job involved biking to school with children at Cherry Valley and Linderman Elementary schools. The group met at Pete’s and pedaled to school. At his training, Deetz rode 17-18 miles the first day, 20 miles the second day and approximately 40 miles the third day, including 20 miles uphill in storm and wind. The fourth day was a shorter ride, he said. It is hoped that the bike patrol will promote good public relations through closer interaction with community residents and visitors. Booth said the department plans to add another bike patrolman next year, but notes that will come after the next training is scheduled in May.